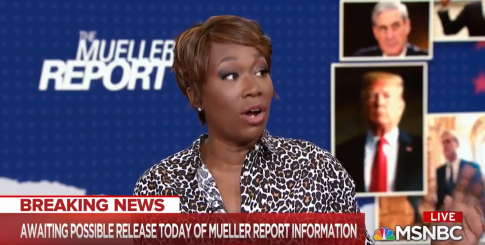 MSNBC host Joy Reid suggested on Saturday that the Trump administration is engaging in a cover-up in regards to special counsel Robert Mueller's report on the Russia investigation. "The fact that this investigation takes place within the Justice Department which Donald Trump essentially controls and he got rid of the problem Jeff Sessions … the one decent thing that he did was recuse himself, this guy is not recused, it feels like the seeds of a cover-up are here," Reid said. MSNBC analyst Malcolm Nance said a cover-up is possible but unlikely due to the number of people involved in the report. "I mean, theoretically it could happen, right," Nance said. "Bill Barr is one guy. There are secretaries, there are people who have to handle these documents. There are the FBI agents who did this themselves. I don't think that there's room for a cover-up because why cover up the greatest scandal in the history of the United States with the greatest scandal in the history of the United States. An attorney general trying to engineer that. I don't believe that's going to happen because if they do, then you can just see copies of this thing falling out by the palate load in front of the Washington Post."